Somewhere behind me the sun was falling headlong towards the horizon as I walked down the Royal Mile. First stop was Sainsbury’s to pick up my hilltop supper, followed by the chip shop where I fuelled myself for the next few hours. 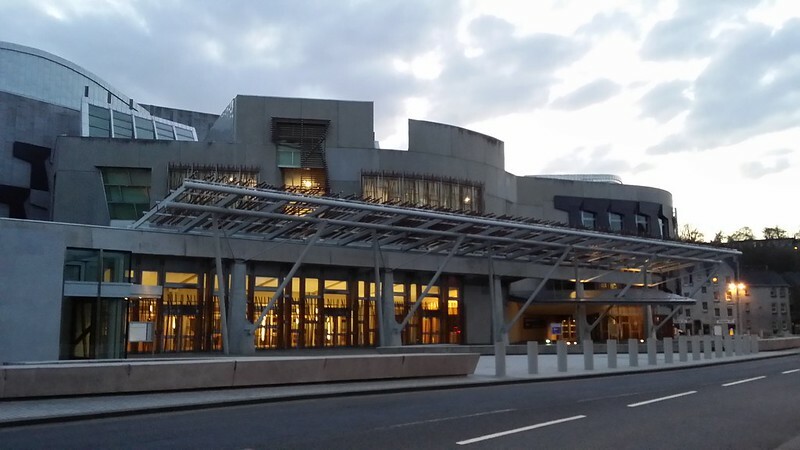 I arrived at the bottom of the Mile and paused a few moments to peer through the gates of Hoylroodhouse (Her Maj wasn’t in), and then walked past the eyesore that is the Scottish Parliament into the Park. There were quite a few people out and about, including as I found out later one of my colleagues. Most were milling about along the roadside that goes all the way around Arthur’s Seat, a few strays were to be found off-tarmac. I climbed up from the road towards the wide boggy depression of Hunter’s Bog. 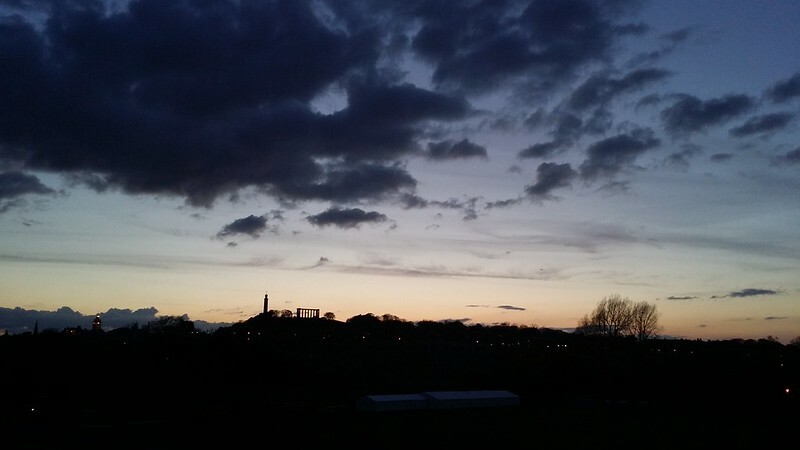 With the light fading fast I stopped and looked back – another of Edinburgh’s Seven Hills silhouetted against the approaching night sky. 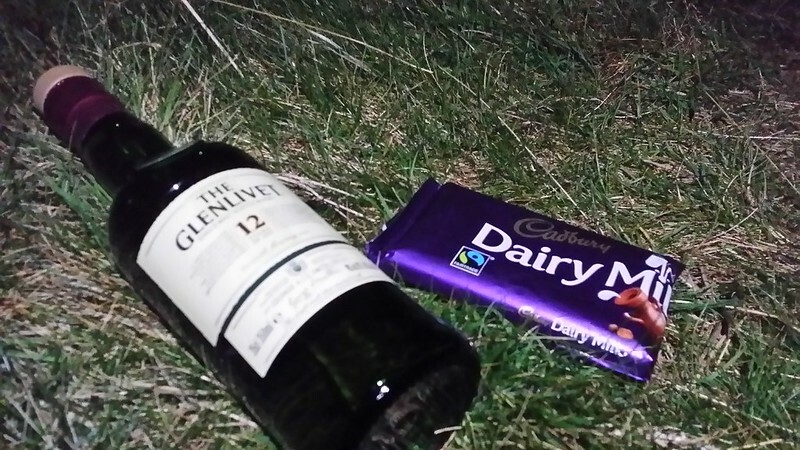 I climbed gently up along the side of the Bog, sneaking past a couple of lads “enjoying” the view – they didn’t look like the sort of characters I would want to know I was sleeping out on the hill. Before I knew it I’d climbed above them and was below the summit cone of the Seat itself. I briefly flirted with a visit to the summit, but night was approaching fast and I still had to find somewhere to pitch in relatively unfamiliar terrain. I crested the ridge and looked down across a smaller depression to my target. Then followed a slightly dodgy sheep track descent to cross to the hill. A lot of concentration was needed in the half light to stay upright, but I made it. I climbed up the gorsey mound and started looking around for a spot to pitch. About twenty minutes were spent walking around in circles trying to find the optimum combination of flatness, discreteness and views, the latter having ultimately to be partially sacrificed. I put up the bivvy bag in the dark, not wanting to show lights, having seen some headtorches across the way on the main summit. Then I settled down for my supper. The headtorches crept down from the summit and headed off to the left and the easy escape route of the road near Dunsapie Loch. 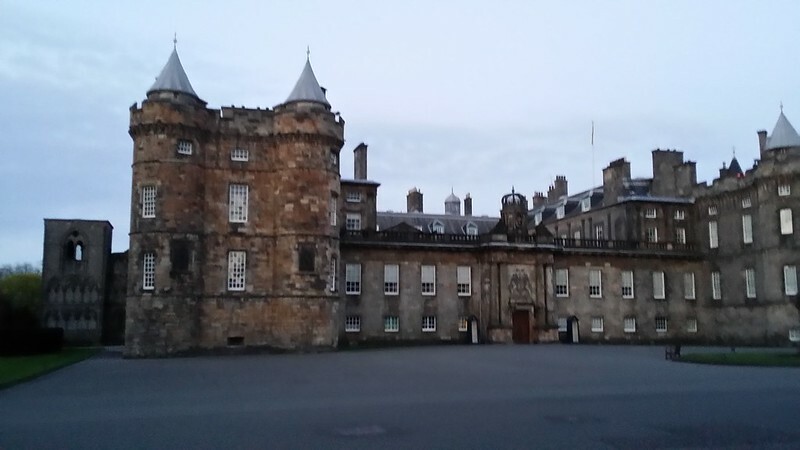 I sat awhile looking at the lights of Edinburgh and the stars above and then turned in. 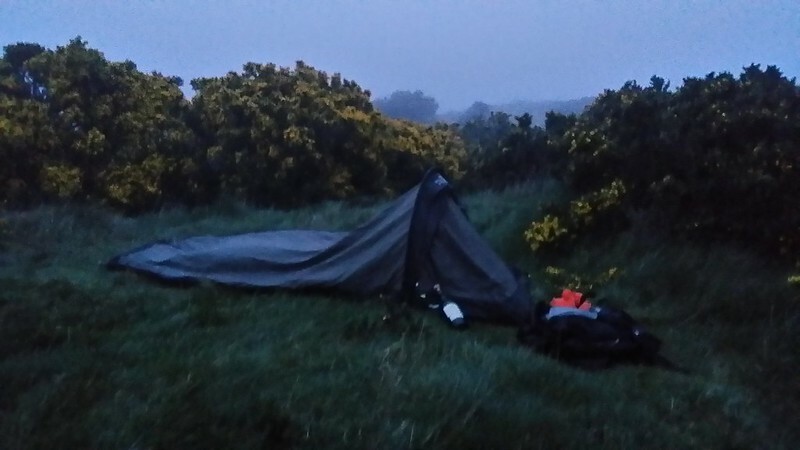 I woke in the early hours to a sensation of dampness and felt the condensation on the inside of the bivvy, some of which had transferred itself to the outside of my sleeping bag. Nothing I could do about it now, although I was surprised how much damp there was on this night forecasted to be dry. Just before 5am I woke for the last time and stuck my head out of the bivvy to be greeted by an enveloping whiteness that was doing a good job of transferring dampness to my shelter. 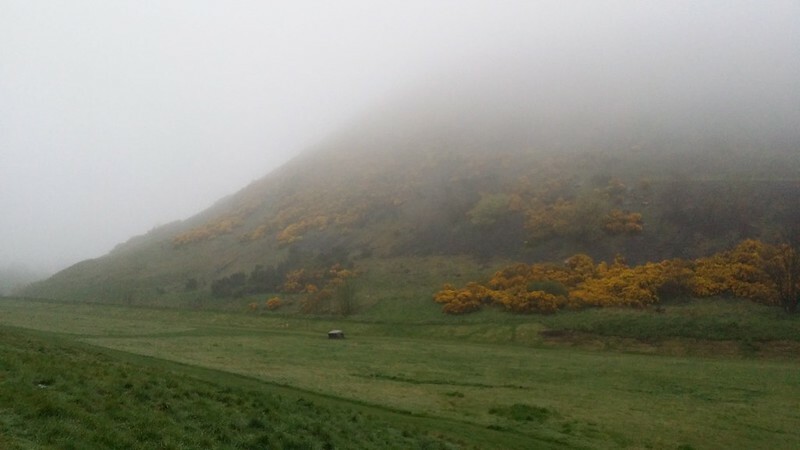 No sunrise for me today, so I packed up and descended carefully on the wet slope to the Loch, following the road down below Salisbury Crags and emerging from the mist into civilisation. 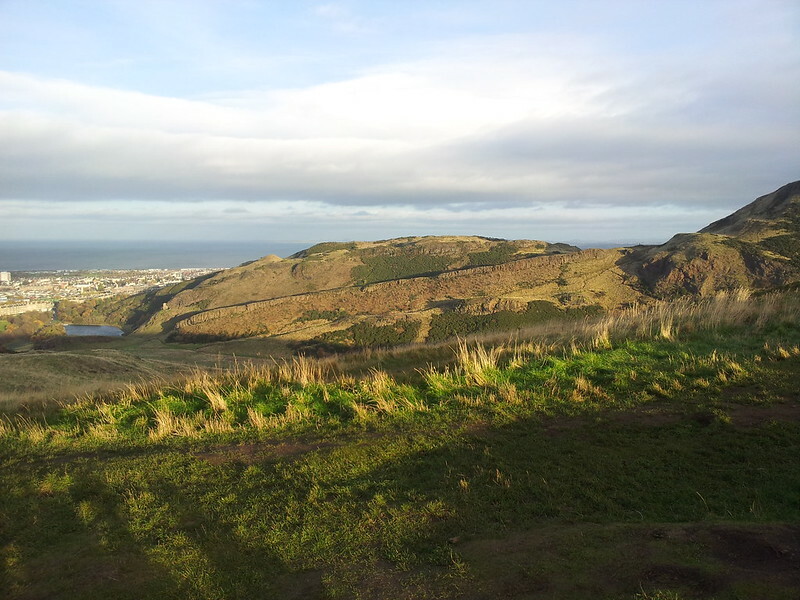 It was great to get out, and I’d promised myself a wild camp before my working stint in Edinburgh ends. Needless to say, my colleagues were incredulous that I would do such a thing. Ah, the joys of a nght snatched under the stars ! Many years ago some friends and I formed an elite cub called the ASA (Alternative Sleeping Arrangements) with the motto ‘Who cares who wins’. Each month we’d pick somewhere daft to sleep, like the central reservation of a dual carriageway, a lift, or a police station roof. I remember one very comfortable nights sleep on a patch of perfectly manicured grass, only to be rudely woken by golfers trying to shift us from one of the greens of Bangor golf course. It’s funny you should say that – I’ve got a list of places to wildcamp, including London and on an island. Maybe not so “out there” as your choices but I guess the principle’s the same.